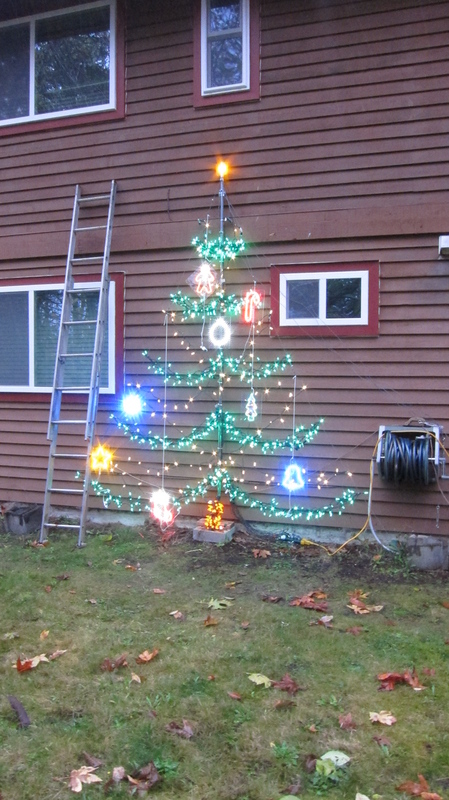 It is holiday lights time, and there have been a couple of upgrades. 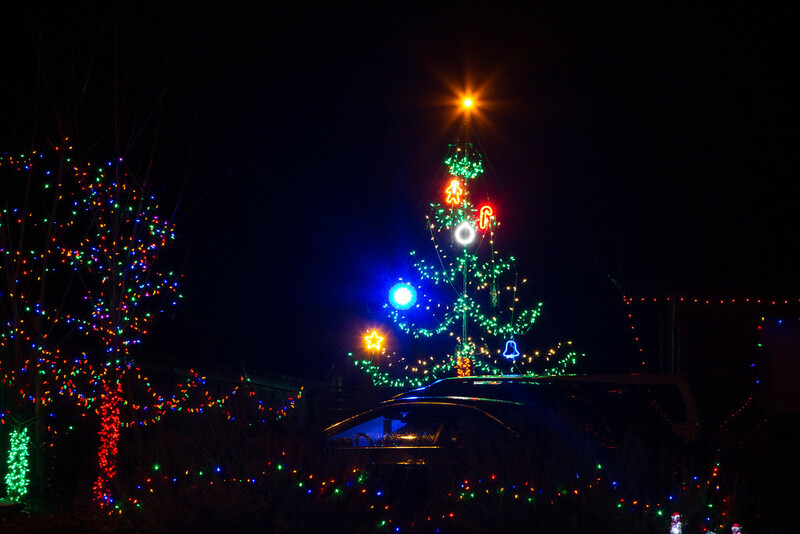 One of my favorite displays is a “tree of lights” – a 15’ tall pole that is attached to one of my fences, and has branches and ornaments, all made out of lights. There are 16 channels for the lights, and it’s driven by a Motorola 65HC11-based controller, connected to solid-state relays. V1.0 had served faithfully for a decade, but it was showing its age; the ornaments on it were made of lights hot-glued to armatures that were made of wire. They took a *long* time to make, and they were very fragile. And if they burnt out, it was really a pain to try to fix them. In the picture above, there is supposed to be a 50-light yellow ball at the top, but it burnt out. Upgrading the center pole from 1/2” conduit to 3/4” conduit. The original was pretty flexy and made it difficult to hold up while the guy wires were attached, but the 3/4” is a screw-together version that is very strong. Upgraded the light strings (5 branches, 2 white strands, a “trunk” strand) to LEDs. Replaced the top yellow ornament with a custom-made 34-LED ornament. Replaced all of the ornaments with custom LED ornaments made out of 5mm LEDs inserted into 1/8” sheet plastic. See more details here. Made all the ornaments detachable, so they can be removed and stored separately. Moved all the low items up higher so that they are visible above my truck. The central pole has 3 guy wires near the top, and then on each side there is a branch wire that comes down at about a 40 degree angle. The branch lights, white lights, and ornaments are all attached to the pole and the branch wires with zip ties. Despite limiting the brightness of the LEDs in the ornaments (most are running at 2-3mA when they could run at 30mA), they put out a lot of light. The blue snowflake puts out enough light that it casts a shadow onto the road about 40’ away. All of them look very nice except for the Orange LEDs, which just don’t put out the light the way the others do. I made one mistake in the reworking; my recollection was that I had 8 ornament channels and 1 channel for the strands of white lights, but it turns out that I had 7 ornament channels and 2 white ones, so the ornament that I hooked up to the white channel does not flash with the others. I could dig out my hc11 code and programmer and deal with it, but this one is fully programmed in assembly and I don’t think I’m that interested. I will likely repurpose one of the ornaments elsewhere. I have one electronics issue. The strands are all controlled with solid-state relays, which worked beautifully with the incandescent lights. On the LEDs, OFF is not off, there’s enough power leaking through to light the LEDs dimly. After a bit of research and consultation, I found that most SSRs have a “snubber” circuit that lets a few mA through even when off, and that’s what’s going on here. Apparently Vishay uses a different design for some of theirs and they have very low leakage currents. My options are to put some load across to pull down the voltage, or to switch to different SSRs. Getting decent pictures are very challenging; the tree puts out so much light that the contrast is huge. By turning my exposure compensation down quite a bit (two stops), I was able to get something. Note how dim the other lights appear, and how washed-out the leds are; they really put out a lot of light. The blue snowflake makes some bushes about 60’ away noticeably brighter when it is on; when I get some time I’m going to have to pull it off and cut the brightness down, because it’s just too bright compared to the others. I also shot a bit of video with my 5D. It doesn’t really do the display justice, but it will give you the basic idea. 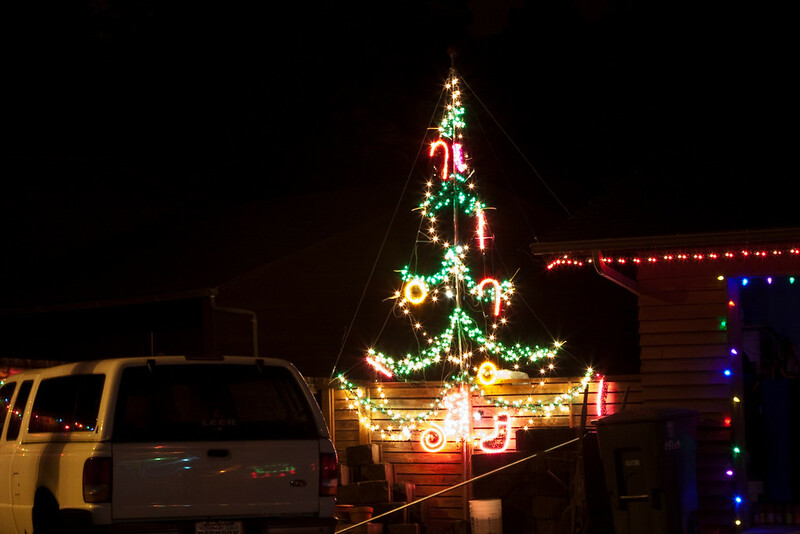 Tree of Lights from Eric Gunnerson on Vimeo.